the first to get it …. Are you the sort of person who is often the last to ‘get it’ or are you one of the first? …. and by ‘get it’ I mean ‘understand’, be in on what is happening, understand the situation or so on or so on. was the first person to really get what Jesus was about. This little statement jumped out and grabbed me as I read the whole gospel. To put this in context everyone else was really taking the piss out of Jesus. Are you really the Messiah? … then do this … do that …. save yourself … if you were the Messiah then you would … Christ was being mocked horrendously. The ‘experts’ of the law and the religious ‘geniuses’ were at the forefront of this mocking. The disciples even frustrated Jesus in that they never seemed to understand what he was about, even though they hung out with him all day long. Out of the centre of this mockery comes this simple statement … ‘Jesus, remember me’. The others, those that should have recognised Jesus, see the humiliation, the sacrifice and can’t believe it is God – they are not seeing what is front of them … they have lost the plot. The disciples get scared and run away. In their minds this cannot be the Messiah. 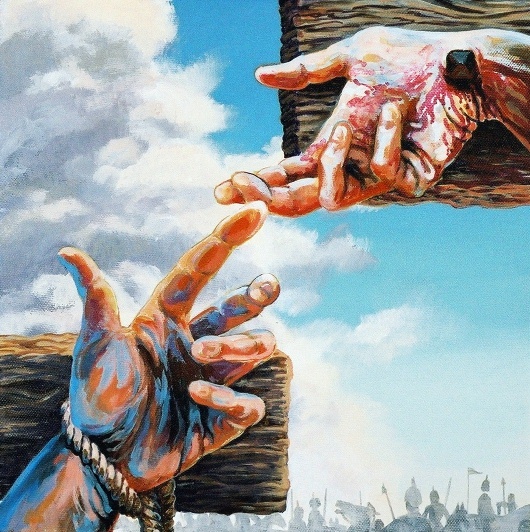 The robber, the condemned man hanging with Jesus sees what is happening and he grasps it, he understands. He gets it – this must be the Messiah! I think we have a scene here that the ‘educated’, those who should know can learn masses from the outsider, the one on the edge, the distraught, the distressed …. the condemned. And that got me thinking about myself, and my interactions with people – I find that often people I meet with get Jesus a lot more than others that I know in the church. I wonder …. what can we learn from Christ from those around us that others may have written off? This entry was posted in lent, theology by robryan65. Bookmark the permalink.